I am a total sucker for all the gorgeous wedding photos that have been flooding my Instagram feed (and come on, you know you are, too). The dresses! The flowers! And my favorite – the venue! There’s nothing like the perfect backdrop to make a wedding that much sweeter, and Kaitlin Holland owns one of the most jaw-dropping Southern venues, styled with her signature vintage charm. What was your first job and the most valuable lesson you learned from it? My first “adult” job was at a consignment furniture boutique in college. I would design mini sets, help customers, manage consignment accounts, and accept or reject drop-offs. I remember the first couple of weeks being completely overwhelmed by the processes and systems. There was such a learning curve for me, and I almost gave up. But everything is hard at first. And then it gets easier and becomes more routine. I learned to push through the tension when it comes to tackling something new. You opened your first business, a vintage rental company, as a college student. How did this experience shape who you are as a business owner today? I knew two things when I began my vintage rental company: I loved hunting for antiques, and I wanted to work in the wedding industry. So my first business really felt like the perfect marriage of the two! But what I didn’t know was how to actually run a business. I learned so many hard lessons in the trenches of that first business — from bookkeeping to pricing for profit to growing at a sustainable pace. But without it, I wouldn’t be where I am today. It’s so amazing to look back over the last six years and to think it all began with a DIY website and a mustard settee stored in my college kitchen! I have since sold my vintage rental company, and I was afraid people would view it as a failure, but I knew in my heart I was saying “no” to a good thing to say “yes” to something greater. Within four years, your dream to educate has turned into over 80,000 followers and sold-out workshops around the country. Tell us the purpose of the School of Styling and the specific aspects you focused on in order to grow it. The School of Styling was a dream filling up my notebooks in the fall of 2013. At the time I was running my vintage rental company, and I so desperately needed business education to meet my creative spirit but I couldn’t find that type of resource anywhere. So after returning home from a conference that didn’t fit the bill, I decided in all of my uncertainty to create what I wish existed for the creative entrepreneur. I am passionate about design, and with an art degree in hand, I knew I had the training to teach fundamentals that would change the way people approached their work. So I found speakers who agreed to come and teach an array of other topics that equip and encourage the creative entrepreneur to do both – business and art – well. I truly believe The School of Styling has grown and succeeded because it meets a very specific need at the right time for the creative community. Social media has had a lot to do with our exposure and subsequent growth, but without a mission that speaks directly to our community, it’s just a bunch of pretty photos with no real meaning. The School of Styling has grown as I have over the years, and I’m so excited to continue to learn and serve this sweet community in new ways. 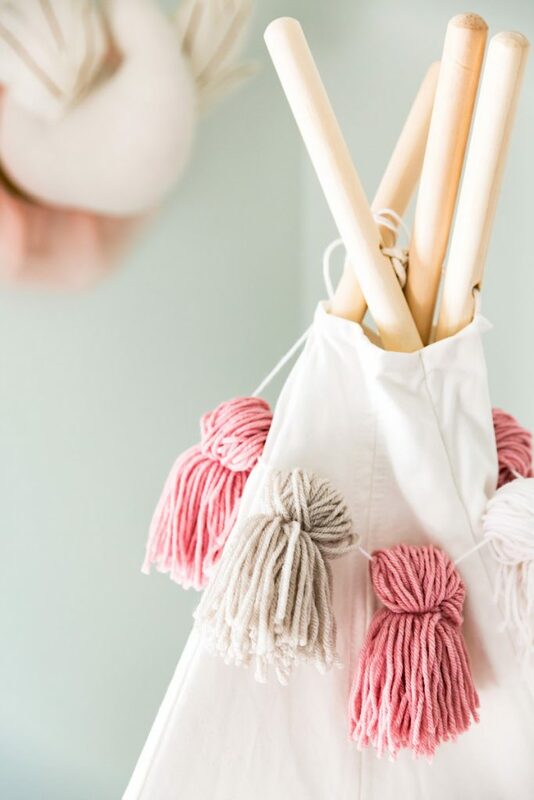 Aside from your inspirational journey with School of Styling, you’re also the marketing director for McAlister-Leftwich, a boutique wedding and event venue. Why did you choose this property, and what obstacles have you faced with the renovation? Whew – this is a fun story! Long story short, my husband asked me what I envisioned doing next, and I told him I would love to open a new wedding venue in our city, Greensboro, NC. I began to look online for available properties and saw the McAlister-Leftwich. When Lucy was 10 days old, we went and viewed it and immediately fell in love. We choose the property because of the two (now connected) historic homes that sit on it (built in 1875 and 1914), it’s proximity to downtown, it’s placement in Historic Fisher Park District, and the character, windows, and light! When we toured we immediately knew there was something incredibly special about this space and we needed to share it with others. We were under contract for about eight months before we finally got all of our zoning, construction plans, and approvals from the city, neighborhood, and historical societies sorted out. This definitely isn’t for the faint of heart! One of our biggest obstacles actually came after we closed on the homes as waited for permits for over 90 painstaking days. Now, we are happily under construction now and while the city has thrown a few more curve balls our way, everything has been resolved. We are on track to finish with construction mid-May. On top of transforming McAlister-Leftwich, you designed a nursery for Lucy, your sweet baby girl. Did you have any important features in mind when you began this process? Was the end result different than you imagined? 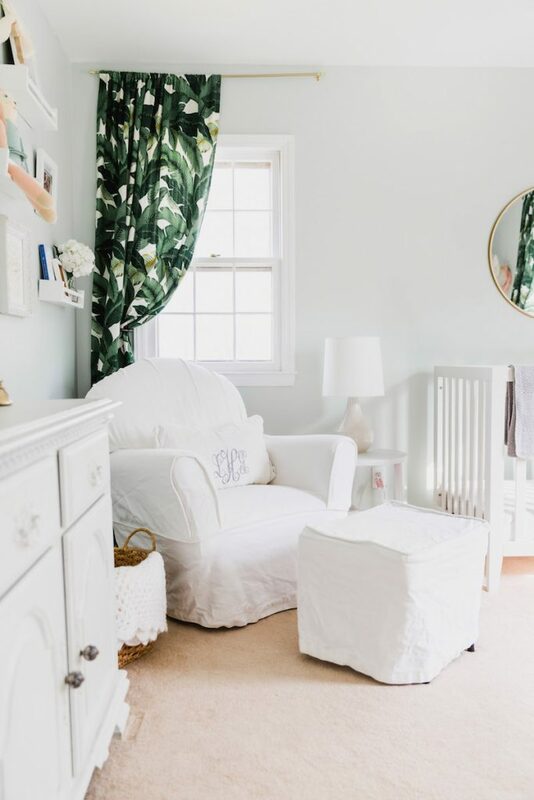 When I began to dream up Lucy’s nursery, I knew I wanted it to be a space that she could grow into and yet still fit her needs as a small child. I didn’t want it to be too serious, yet I still wanted it to feel sophisticated and clean. And most importantly, I wanted her to feel comfortable to play, dream, create, and imagine in her room. It’s her’s, after all! Although I changed directions when it came to the aesthetics of the room, I think I accomplished what I set out to do. The neutral wall color with the classic white furniture is so calming. What made you decide on this look? This question made me laugh because I initially went a completely different direction with her paint. In fact, we painted three coats of blush on the walls before I realized I hated it. 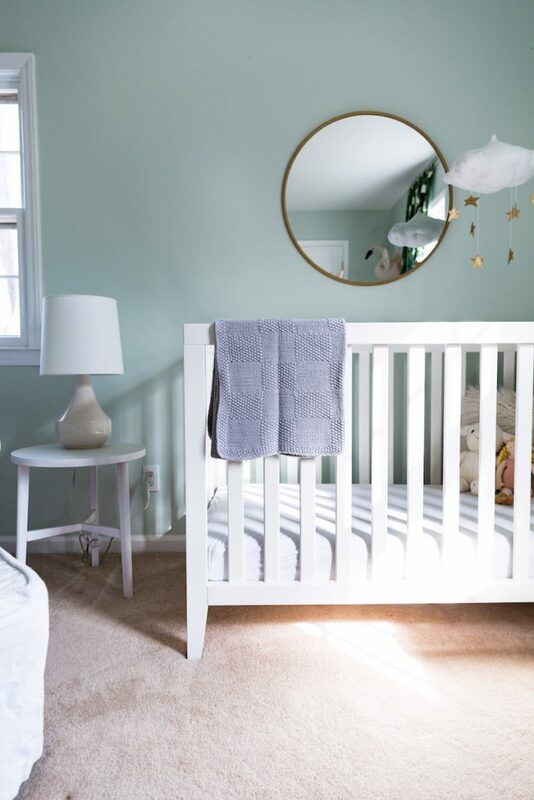 Eleven paint samples later and I finally fell in love with Quiet Mint by Valspar (lightened 75%). (I blame the whole paint saga on pregnancy hormones because they are so real. My poor husband). But now it’s my absolute favorite color, and it looks amazing no matter how the sun is shining through. I opted for white furniture to keep the space light and dreamy. I imagine as she gets older we will add punches of color, but I loved how simple and beautiful the mint and white are together. 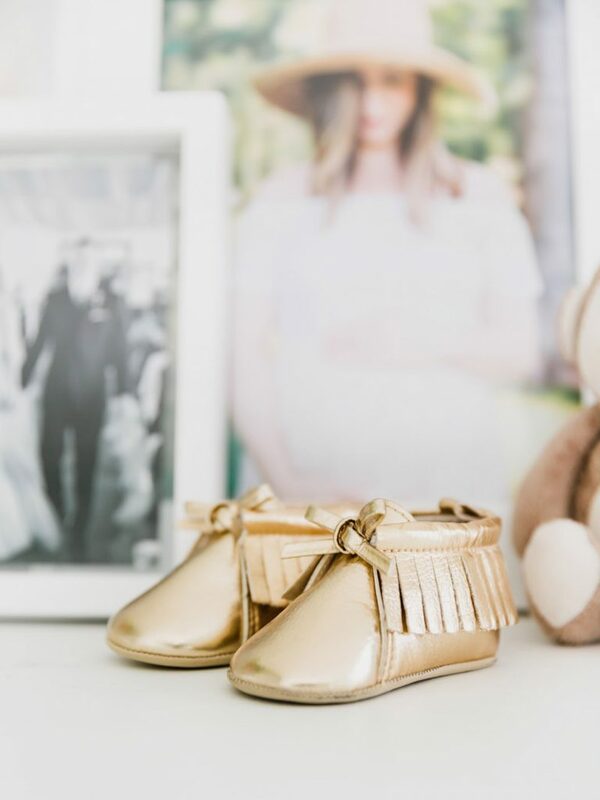 We’re gushing over the gold accents around the nursery. Are there rules you followed to pull off subtle details? My goal was to incorporate touches of gold into each vignette in the space. So no matter where the eye looks, you get a hint of the gold accents. 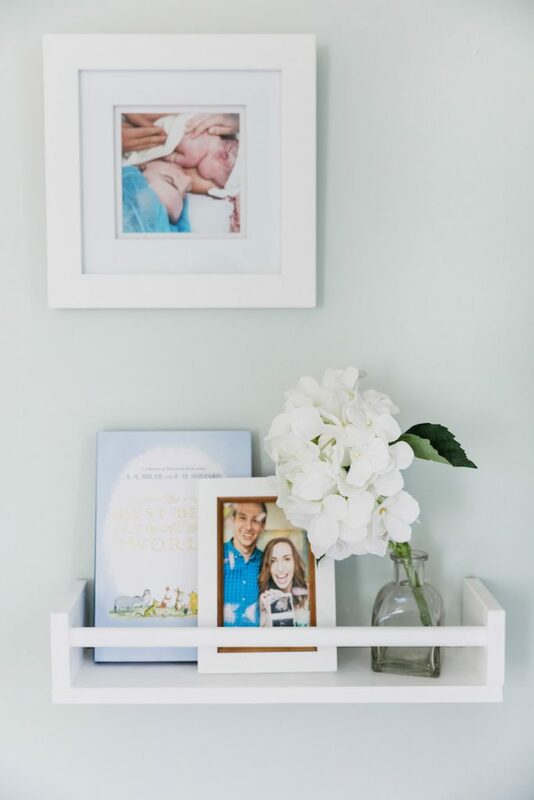 In a nursery, there are so many ways to incorporate accent colors in creative ways! 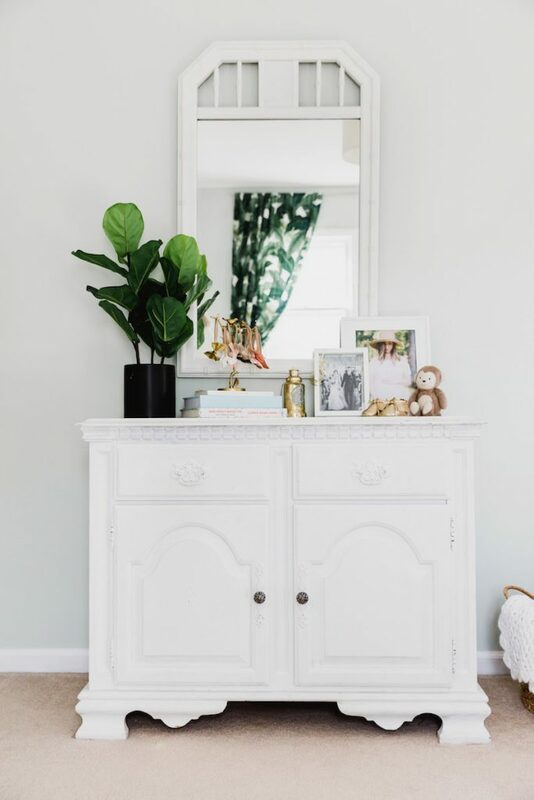 I used shoes, prints, a mobile, hardware, a mirror, and a jewelry stand to help pull off the look, but the options are endless. Of course, we have to mention the bright green curtains that give this space such great personality. What tips do you have for people who want to incorporate a bold piece without taking away from the rest of the room? 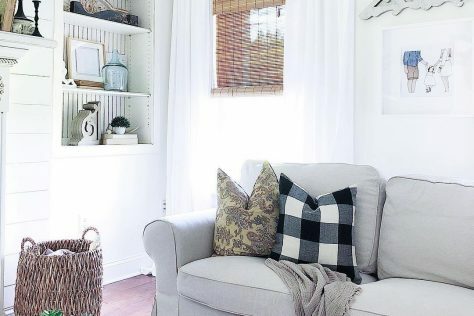 I was so afraid to do something bold in my home for the longest time, but these curtains spoke my language. 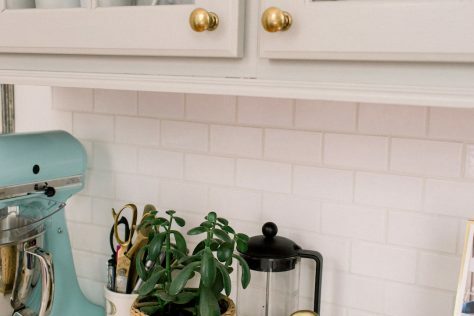 Here’s why I think they work: 1) they are in the same color family as the walls, so they don’t contrast too much or feel too random, and 2) they are the only bold accent in the room. 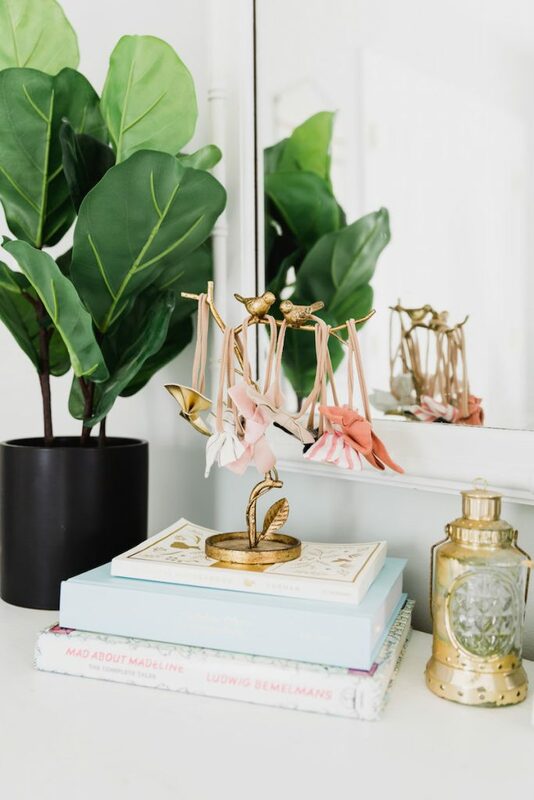 If you’re worried about incorporating a bold color or pattern into a space, try creating a tone-on-tone statement by working within your current color scheme or just adding a splash into one smaller element of the room. 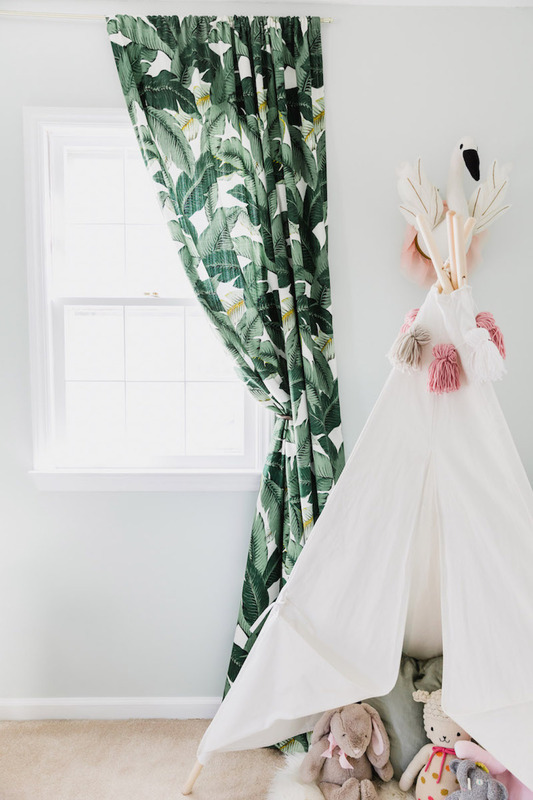 We love the teepee and polar bear rocker – they’re chic additions to the room that also prove functional. 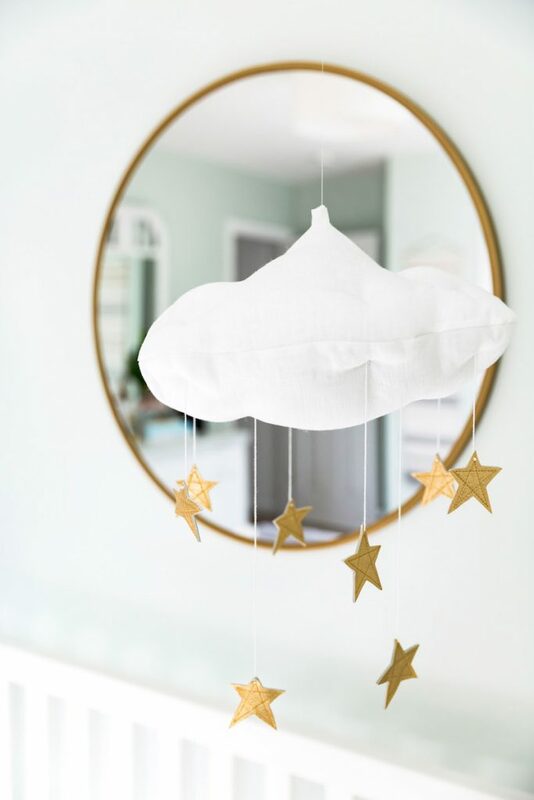 Where are your go-to places for baby/nursery decor? I’m a firm believer that good design doesn’t have to cost a fortune! 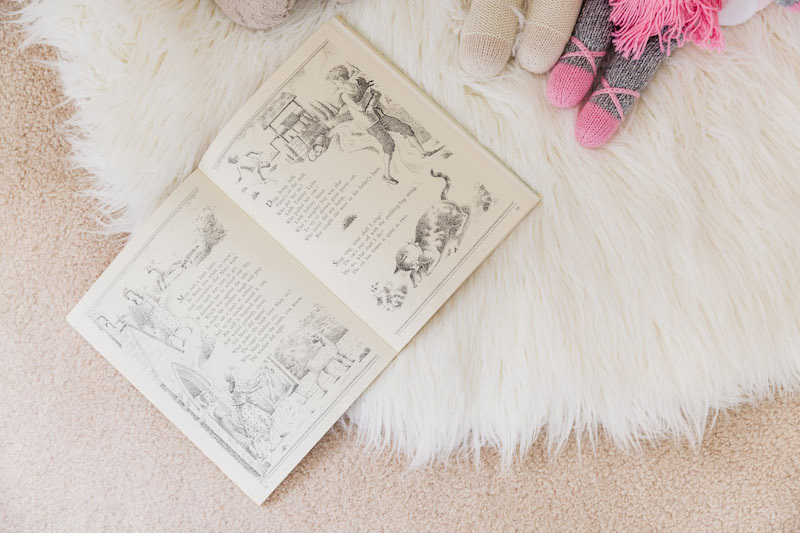 In fact, I love the stories that go along with so many of the pieces in Lucy’s nursery. 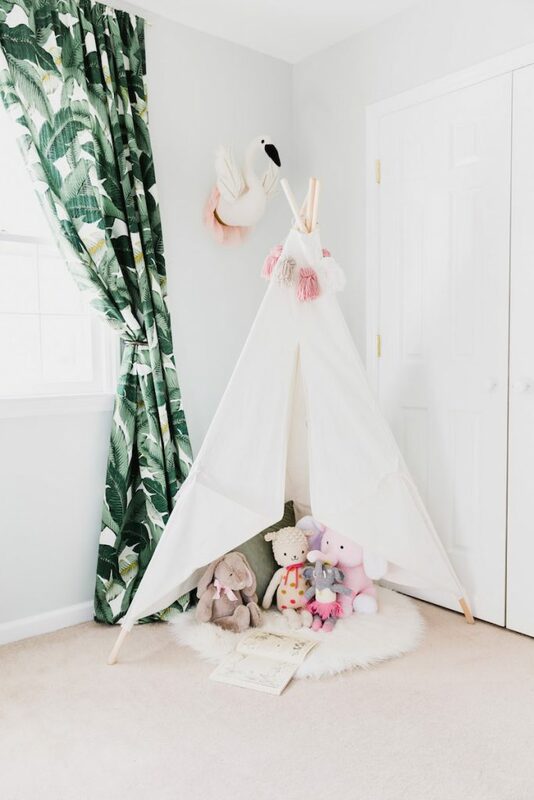 My mom made the curtains and the slipcover for my second-hand rocker purchase, the china hutch that serves as Lucy’s dresser was from my vintage rental company days, and so many elements in her room – from the mobile to the teepee to the books — were gifted by our dear family and friends. I love looking around her room and thinking about all of the people who love her! 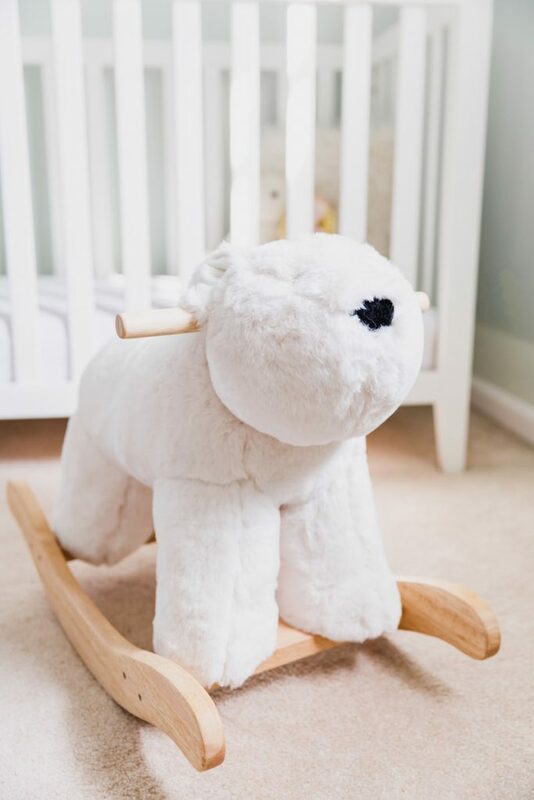 Other than second-hand and antique stores, my favorite baby and nursery decor places are Pottery Barn Kids, Land of Nod (now Crate and Kids), and Target. What’s your favorite part of the room? I think my favorite part of the room would have to be the rocking chair area. I’ll never forget driving to pick up the rocking chair and the woman I was purchasing it from said, with tears in her eyes, “This chair saw my girls and me through a lot of long nights. I pray it will hold the same sweet memories for you.” And goodness was she right. Mine and Lucy’s relationship grew and deepened in that rocking chair. 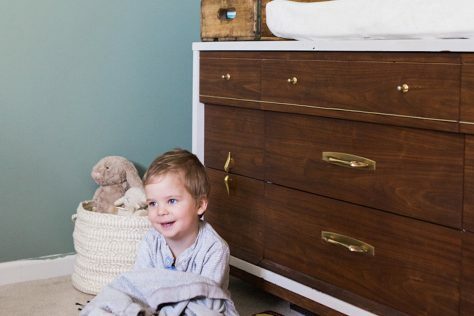 How would you describe your decorating style, and what transitional skills have you learned from this design process that have helped you as a mother? I would describe my style as traditional, storied, refined, and layered. 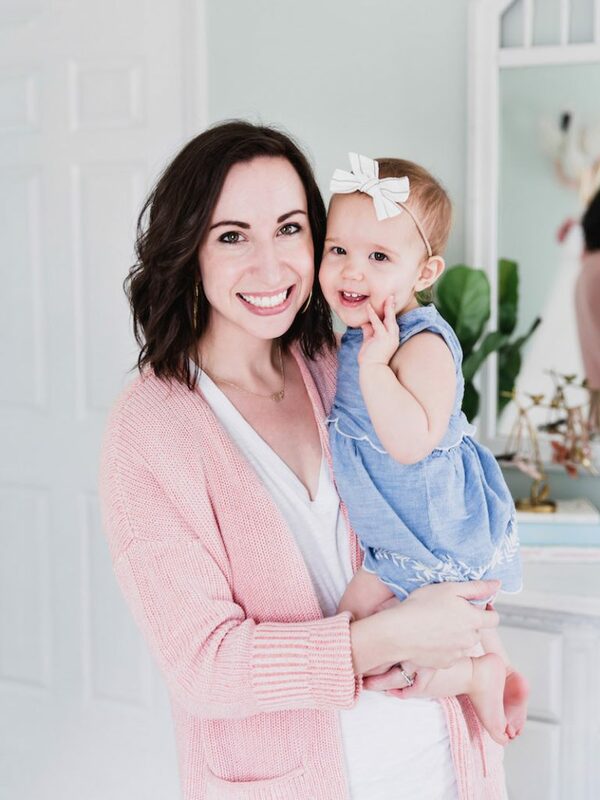 This process changed so much over the months leading up to her birth, but I think the biggest lesson I learned was in the hospital recovering with Lucy. After a quite traumatic birth experience that ended with an emergency c-section (you can read the full story on Instagram #littlelucybirthstory), I remember doing skin-to-skin with her and thinking, “Even if I were taking her home and she didn’t have a nursery, I would be happy. 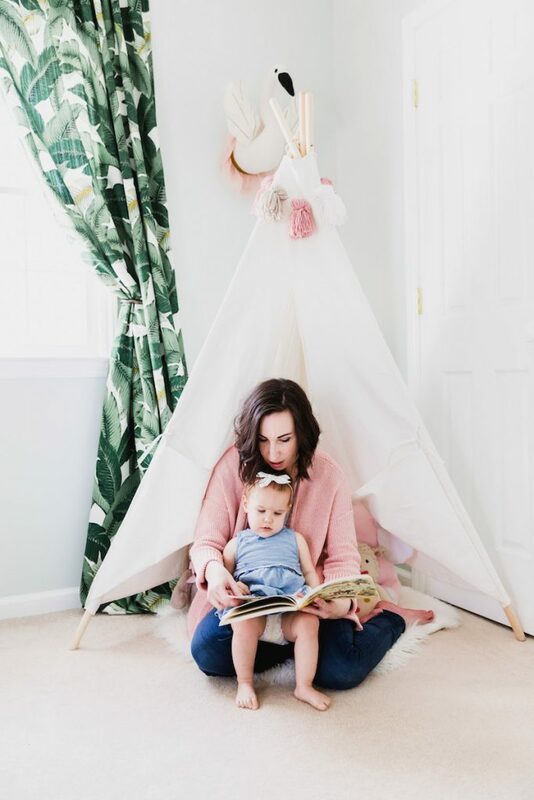 I have everything I need right here.” I think having a child puts things into perspective unlike much else, and I’m so grateful for the way she encourages me to slowly let go of things that just aren’t that important in the end. So, if you’re in an overwhelming season of life, prepare your heart before you prepare a room. I promise the room can (and will) come together in time! 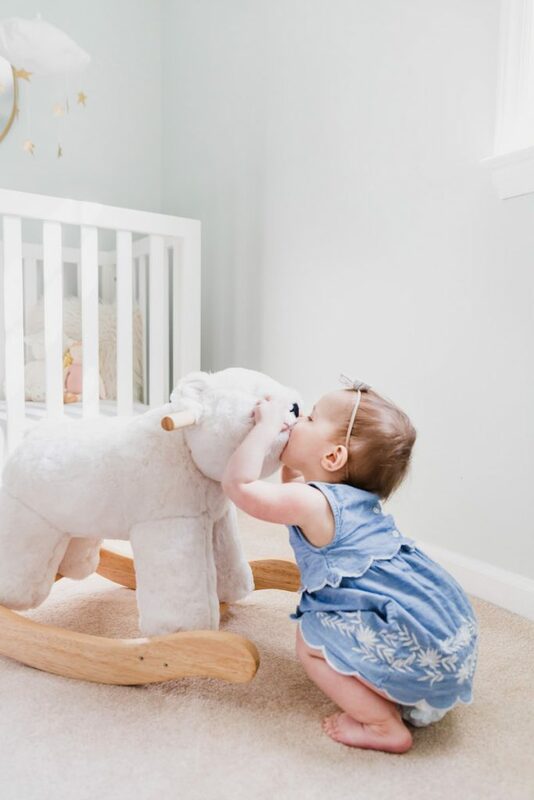 In what ways has the nursery helped you strengthen your bond with Lucy? We have spent more hours than I can count in that room together. From sleepless nights (and days) to playing with dolls, to reading books and saying bedtime prayers, that little room has held so much life. I love that it’s a space completely for her – and for me to watch her as she grows and changes and experiences the world. How do you want Lucy to feel when she’s in her nursery? And how do you feel when you’re in it? I want Lucy to feel safe and loved when she’s in her nursery. I want her to know that she has a home and a space that was specifically and specially created just for her. I want her to know that she can create and imagine and play and not mess a single thing up. When I’m in her nursery, I feel an overwhelming sense of gratitude for this hard, beautiful work of motherhood. What a gift that I get to watch my girl grow up! Best children’s book to read out loud? Jesus Storybook Bible (brings me to tears every time!). Go-to brunch order? In the South, we can get shrimp and grits at any meal…so shrimp and grits, please! Current song playing in your car? Do podcasts count? That’s pretty much all I listen to these days. I’m especially in love with Young House Love Has a Podcast! Latest show binge? Parks and Rec… for the 5th time. Guilty pleasure? Definitely a glass of chardonnay (or two) at my favorite wine bar with my hubby. Best way to end a bad day? Family snuggles, a movie, and takeout for dinner. We’re total homebodies! Favorite part of being a mom? The list is pretty much endless. If I had to pick, I would say getting to know and love the sweetest, cuddliest, and silliest little girl in the world.